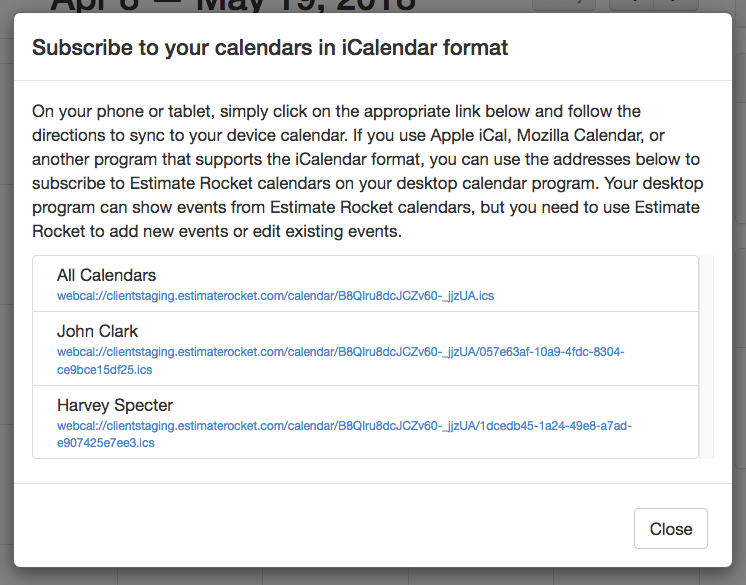 Subscribe to your Estimate Rocket calendar from any service that supports the iCal or ics calendar format, including: Apple Desktop and Device Calendars, Android Calendars, Google Calendars, Yahoo Calendars, and many others. This process is the same for all email clients and services. NOTE: Google Calendar takes 3-12 hours to sync new entries. This is something Google controls and there is no way to change it. If you need you calendar to be updated immediately you need to use a service such as Apple iCal or Outlook. 1.) Login to your Estimate Rocket account and go to the Schedule screen. 2.) Click on the Subscribe to Calendar link in the lower right corner of the screen. 2.) Select the link for the calendar you want and follow the prompts on your device to complete the setup. All Calendars will show you all Employee appointments that you have access to. A specific User's Calendar will show you only that user's appointments. You can subscribe to multiple User Calendars if you want. 3.) Open the calendar you want to sync with and use their Add Calendar feature and enter in the link you copied from Estimate Rocket. You should now see your Estimate Rocker appointments in your calendar of choice. Feel free to contact us if you have any questions. Here's a video tutorial about Subscribing to your iPhone.